Can SiC power electronics player, Anvil Semiconductor, deliver high performance green LEDs at CMOS prices? Compound Semiconductor finds out more. Anvil Semiconductors has grown cubic GaN on cubic SiC-on-silicon wafers; are LEDs next? While Anvil Semiconductors has carved a name for itself developing SiC power semiconductor switches based on its novel, low pressure CVD growth process, the UK-based Warwick University spin-off is now eyeing LED markets. Joining forces with the Cambridge Centre for GaN at the University of Cambridge, the organisation has grown cubic GaN on cubic SiC-on-silicon, or 3C-SiC-on-silicon, wafers via MOCVD. Sample LEDs are next. "We've been talking about growing cubic GaN on cubic SiC for around a year, as this potentially opens up the LED market for our 3C-SiC on silicon material," explains Jill Shaw, chief executive at Anvil Semiconductors. "Growing cubic GaN is very difficult and nobody has successfully done it using a commercialisable process before, partly because they haven't grown it on the (100) face of a reasonably lattice matched substrate such as cubic SiC," she adds. As Shaw highlights, the company's intellectual property lies in growing cubic SiC-on-silicon for power device applications. 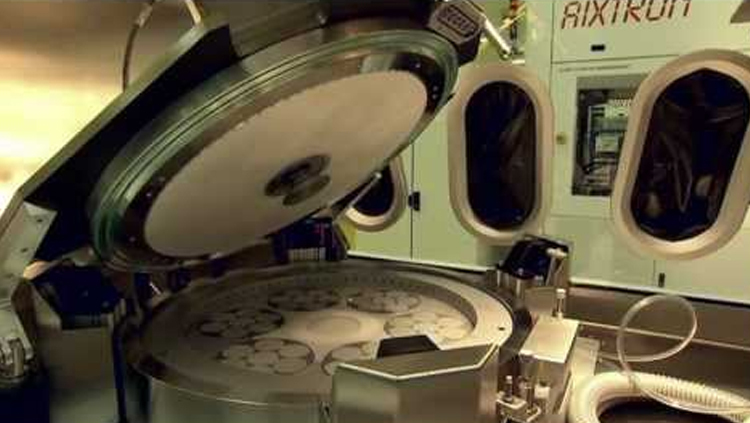 Prior to SiC growth, a mask is placed over the silicon wafer to define structures in the scribe lines of the wafer. Anvil researchers then deposit a 1.5 Âµm-thick layer of heavily doped, dislocated material onto this silicon seed wafer to relieve stresses from lattice mismatches during SiC growth. Monocrystalline 3C-SiC is then grown in the die area between the scribe lines - where future devices will be fabricated - with polycrystalline SiC forming in the lines to soak up the thermal expansion differential stresses across the entire wafer. Having fabricated 650 V Schottky diodes, MOSFETs and more, the process clearly works for power semiconductors, but can it stretch to LEDs? While researchers worldwide, have already grown conventional hexagonal GaN on sapphire, SiC, bulk GaN and silicon wafers, via MOCVD, cubic GaN is a different matter. Compared to hexagonal GaN, the cubic polymorph has no internal electric fields, a narrower bandgap and faster transport properties, paving the way to better performing green LEDs. However, the cubic phase of GaN is metastable, so from a thermodynamic perspective, the crystal structure of the semiconductor tends to revert to the lower energy hexagonal polymorph. But, by modifying MOCVD parameters such as gas flow and temperature, the Cambridge Centre for GaN team managed to grow cubic GaN on quadrants from Anvil's 100mm diameter 3C-SiC-on-silicon wafer. "The Cambridge researchers actually said they didn't think the cubic GaN phase would be stable and growth would be difficult," says Shaw. "But by carefully selecting MOCVD parameters they successfully grew single phase cubic GaN straightforwardly and at a similar growth rate to hexagonal GaN." With success in hand, the researchers are also growing multi-quantum well structures onto the material, the next step to proving the material can be used to make LEDs. Indeed, as Shaw puts it: "So far all we have done is demonstrate that you can produce cubic GaN on cubic SiC; we've still got to be able to develop LEDs." But having applied for a government-funded Innovate UK award - designed for developing innovative engineering ideas - Shaw and colleagues are hopeful a demonstration LED could be developed within a six month program. In the meantime, cost remains an obvious issue. Talk to LED industry players, and the jury is out on whether or not GaN-on-silicon LEDs actually make financial sense. Proponents point to how fully depreciated CMOS equipment can be used to cheaply grow decent-performing LED structures on large silicon wafers. Meanwhile, others question the cost-savings as sapphire wafers get bigger and the performances of GaN-on-sapphire LEDs improve. But for Shaw, Anvil's route to LEDs could offer a key advantage. "With our process, you have the advantage of fabricating LEDs on a large silicon wafer but potentially you also get efficiency improvements from using cubic GaN," she says. "So we're effectively bringing the performance benefits of LEDS made in cubic GaN grown on SiC down to silicon prices." The business case is compelling, and as Anvil awaits government funding to proceed, Shaw is eyeing potential industry partners to help commercialise the technology. "We intend to act as a fabless supplier of 3C-SiC-on-silicon wafers in the LED market," she says. "So partners could range from larger LED manufacturers that want to develop LEDs on cubic GaN on 3C-SiC-on-silicon wafers to substrate suppliers. There is a wide range of opportunities as far as we're concerned."